Reattaching a Shadow, Peter Pan, Disney Studios, 1953. Figure 1.1, Grasping Shadows: The Dark Side of Literature, Painting, Photography, and Film (OUP 2017) by William Chapman Sharpe. But as the famous example of Peter Pan’s amputated shadow reveals, shadows depicted in artworks can be arbitrarily shaped, placed, and even cut off by their creators. 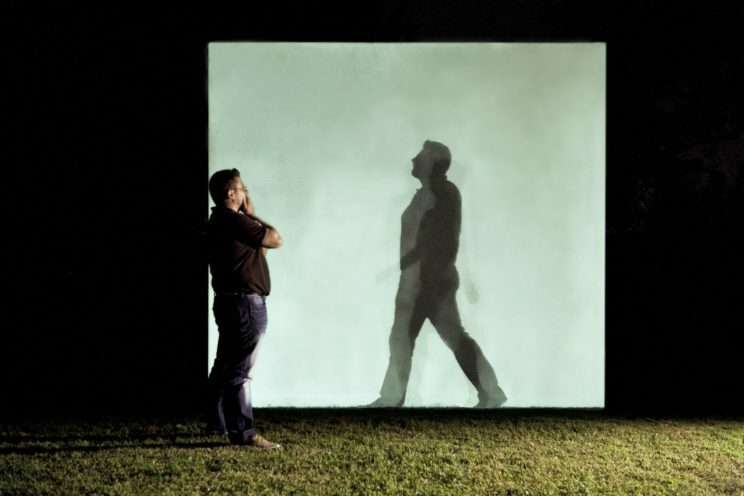 Therefore, beyond offering physical information, shadows have much to tell us on a social and psychological level. 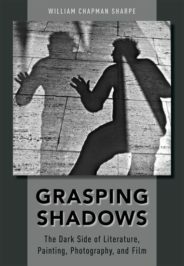 Consciously or not, whenever we see shadows we “read” them (and their creators’ intentions) in a cultural context that lends the shadows power or denies their substance, causing them to seem prophetic or threatening or willful or wispy. In the course of a dozen images, this timeline shows how some of the key meanings of cast shadows have developed over the centuries. 1. Since classical times, artists, scientists, and philosophers have argued about the value of shadows. The ancient Greeks were the first artists to use cast shadows, as they developed a “geometry of the light” that located objects in relation to a consistent light source. Mistrusting the way that shadows helped such painters to deceive the eye, Plato insisted that shadows mislead people about the true nature of reality. In his Allegory of the Cave (375BCE), Plato set up a shadow-substance opposition that has dominated Western thinking about shadows ever since. 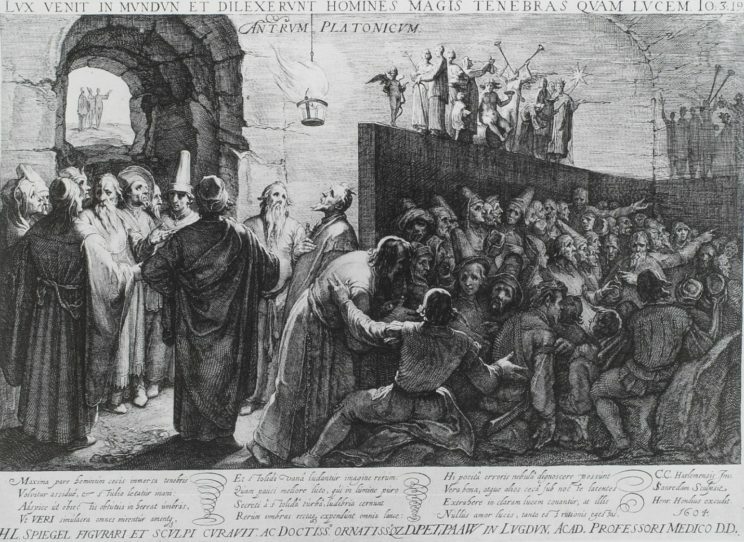 Jan Saenredam (printmaker) and Cornelis van Haarlem (artist), Plato’s Allegory of the Cave, 1604. Public domain via Wikimedia Commons. 2. 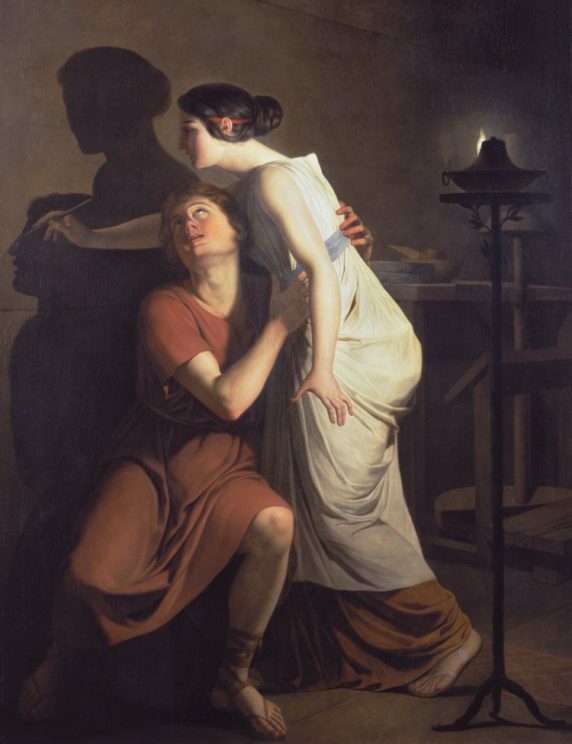 As if to challenge Plato’s reasoned dismissal of shadows, the Roman historian Pliny the Elder asserted in his Natural History (79 CE) that art was born when a young woman named Dibutades traced the shadow of her lover on a wall, by the light of a lamp. Since the lover was about to leave on a long journey, the shadow image not only became the first human-made representation, it also became an almost magical substitute for his presence. While Plato thought that shadows were dangerously false, Pliny suggested that they could be romantically true, as if to capture a person’s shadow was to capture part of his vital essence. Joseph Benoit Suvée, The Invention of the Art of Drawing, 1793. Public domain via Wikimedia Commons. 3. The story of Dibutades was highly popular in the 18th Century, when it reinforced the vogue for a new form of shadow-capture, silhouettes. In English, cut-paper silhouettes were first known as Shadowgraphs or Shades, since they were often made by tracing a person’s shadow. Silhouettes exploit one of the key features of the shadow, its dark, mysterious interior, into which viewers can project whatever details imagination can provide. 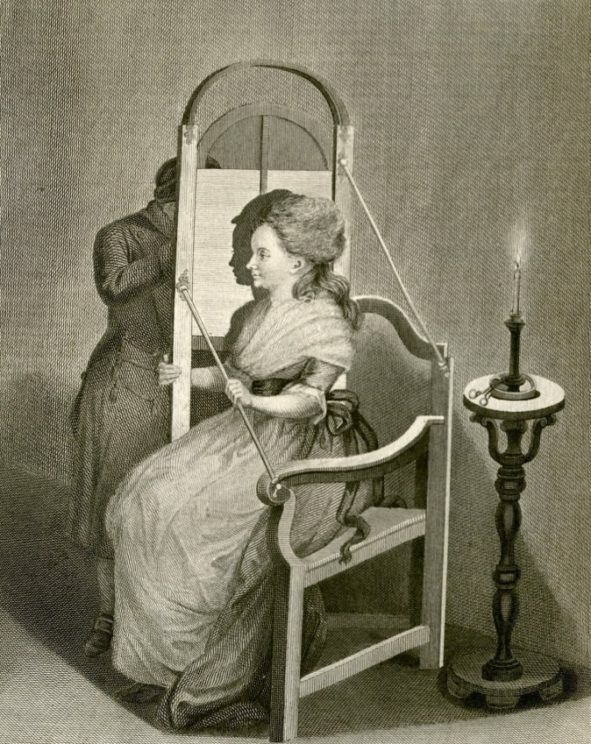 Thomas Holloway, A Sure and Convenient Machine for Drawing Silhouettes, 1792. Figure 2.17, Grasping Shadows: The Dark Side of Literature, Painting, Photography, and Film (OUP 2017) by William Chapman Sharpe. 4. Meanwhile, after a dormant period in medieval times, Renaissance artists returned to the Greco-Roman shadow and developed its use in relation to the emerging art of perspective. Shadows became more accurately shaped and placed, even as unwritten rules governed their use so that they would not impinge too greatly on the human figure. 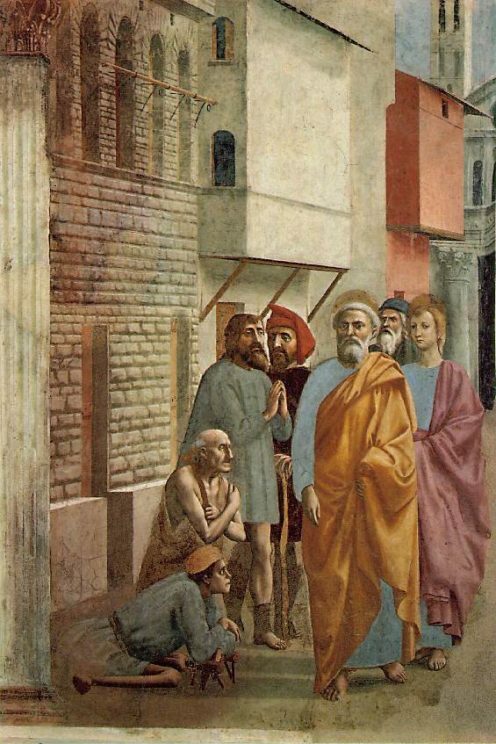 In Masaccio’s The Tribute Money (1425), for example, cast shadows cover the ground but never obscure the human form. Masaccio, The Tribute Money, Brancacci Chapel of the basilica of Santa Maria del Carmine, Florence, 1425. Public domain via Wikimedia Commons. 5. In the first painting to make a shadow its primary subject, Saint Peter Healing the Sick with His Shadow (1427-1428), Masaccio made sure that the transformative shadow of St. Peter falls around and under the figures that it touches with its heaven-sent power. Like many villainous shadows later to come, the holy shadow has a special power that emanates from its source, but the Renaissance painter will not let the shadow dominate the work pictorially. Masaccio, St. Peter Healing the Sick with his Shadow, 1427–1428. Public domain via Wikimedia Commons. 6. From the Renaissance onward, most painted shadows serve to make objects seem more “real” in volume and placement, but Rembrandt was a pioneer in giving the shadow psychological weight. 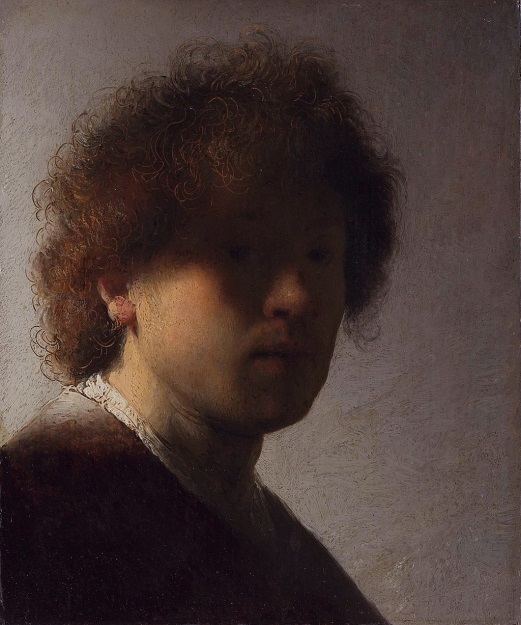 In an early self-portrait he depicts himself with his eyes in shadow, as if to show how his very vision is embedded in the chiaroscuro that makes his paintings so dramatic. Rembrandt van Rijn, Self-Portrait, 1629. Public domain via Wikimedia Commons. 7. After the Renaissance, the Western world adapted so well to the idea that artistically rendered people need shadows that the absence of a personal shadow could cause a great commotion. 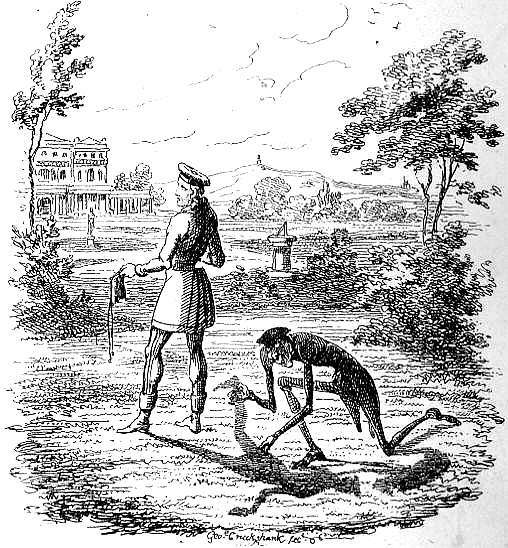 Illustrated by many artists, Adelbert von Chamisso’s story of Peter Schlemiel, the man who sold his shadow (1814), became a big hit in Europe in the early nineteenth century. Since Peter’s acquaintances would have nothing to do with a man who had no shadow, it became clear from the story that having a shadow was a sign of humanity, a signal of full participation in human life. George Cruikshank, Peter Schlemihl Selling His Shadow, 1827. Public domain via Wikimedia Commons. 8. But only a few decades later, the first stand-alone shadows of humans appeared in art, independent of anybody to cast them. It was as if the shadow alone could now do the work of the substance-shadow couple. 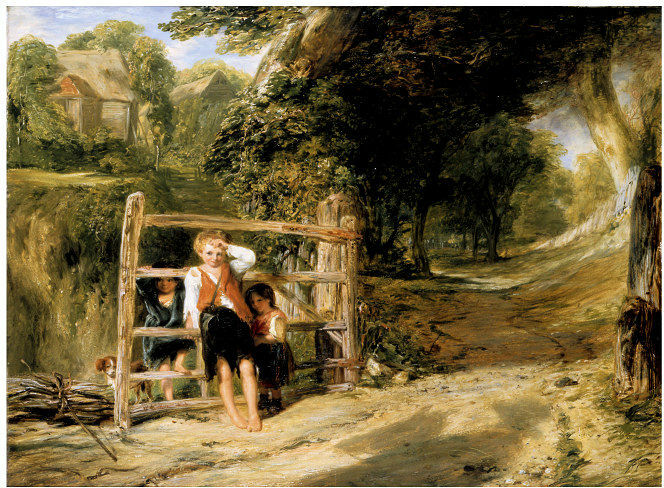 It was William Collins who discovered in his painting Rustic Civility (1833) just how visually effective a “mere” shadow could be, introducing a powerful narrative element at the same time. Here children open a gate for their social “betters,” in the form of a horseman who represents the English country gentry. William Collins, Rustic Civility, 1833. Victoria and Albert Museum, London. Used under Fair Use via Wikimedia Commons. 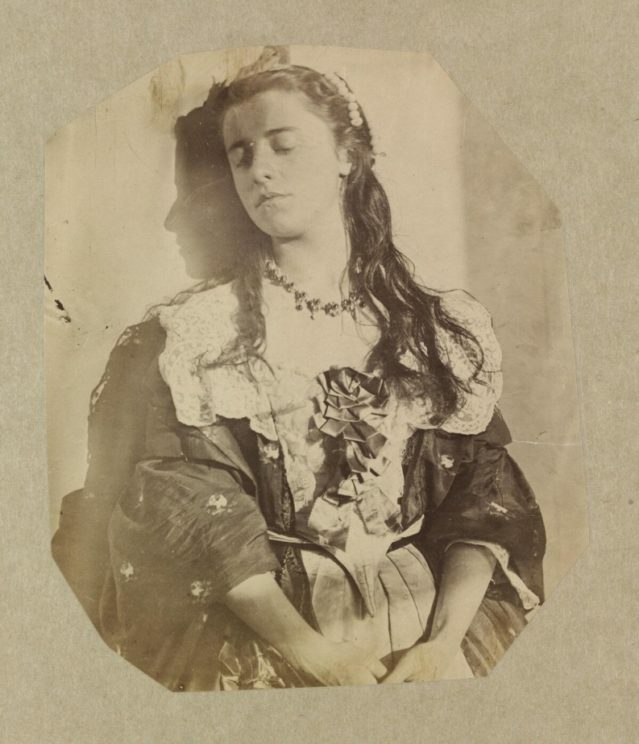 Clementina Hawarden, Isabella Grace, 5 Princess Gardens, 1861—1862.Victoria and Albert Museum, London. Figure 2.18, Grasping Shadows: The Dark Side of Literature, Painting, Photography, and Film (OUP 2017) by William Chapman Sharpe. 10. As cinema developed, film directors rapidly picked up the atmospheric and dramatic shadow-vocabulary used by painters since the time of Caravaggio and Rembrandt. In classics such as The Cabinet of Dr. Caligari and Nosferatu, the German Expressionists made shadows into active participants in the drama. “Murder by shadow” soon became an integral part of cinematic lore. The Shadow’s Prey, Nosferatu, directed by F. W. Murnau, 1922. Used under Fair Use. 11. 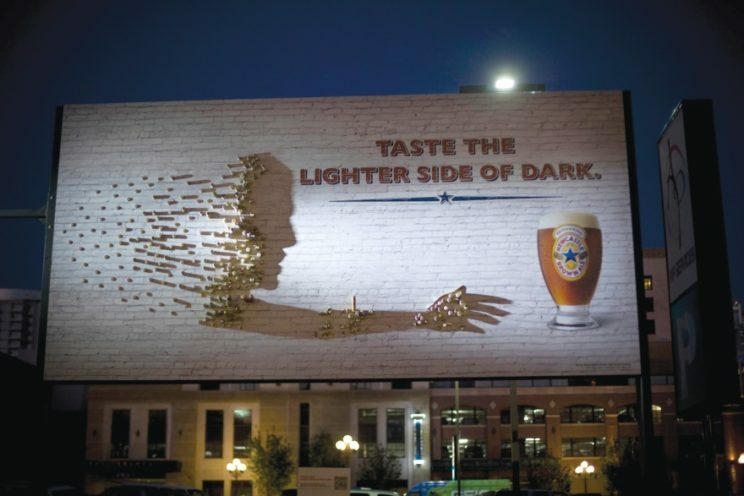 More recently, artists have used actual shadows made by high-powered lights to construct interactive street art in which people can encounter their own shadows in settings that reveal just how alien yet also reassuring shadows can be. Mario Martinelli, Meeting the Shadow, 2013. Used under Fair Use. 12. Wherever art goes, advertising soon follows. Some of the latest forms of advertising use immaterial shadows to sell tangible goods. If in contemporary art the shadow plays, on today’s billboards the shadow pays. Ellis Gallagher and Pablo Powers, “The Lighter Side of Dark,” 2011. Used under Fair Use. Featured image: Photo of shadows by terimakasih0. Public domain via Pixabay. William Chapman Sharpe is Professor of English at Barnard College, Columbia University. He is the author of Grasping Shadows: The Dark Side of Literature, Painting, Photography, and Film.